As a result of an unusual flood of immigration prosecutions, the total number of federal criminal filings reached an all time high in the just ended fiscal year, according to timely Justice Department data analyzed by the Transactional Records Access Clearinghouse (TRAC). The latest data show that the number of all kinds of federal criminal prosecutions peaked at 169,612 cases in FY 2009, up nearly 9 percent from the previous year's total of 155,694 and 42 percent from five years ago when prosecutions came to only 119,492. The comparisons of the number of defendants charged with offenses are based on case-by-case information obtained by TRAC under the Freedom of Information Act from the Executive Office for United States Attorneys (see Table 1). ... only thirteen employers in eight cases were prosecuted for the felony offense of illegal hiring of undocumented workers. This across-the-board increase occurred even while the counts for most of the broad categories of cases the Justice Department used to track its activities were up only slightly or actually had declined. The major factor driving the overall increase has been the sharp rise in individuals prosecuted for immigration offenses. 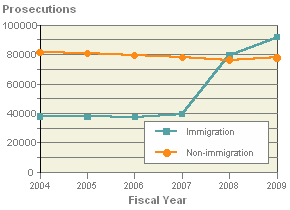 Last year immigration prosecutions jumped 15.7 percent — from 79,431 during FY 2008 to 91,899 in FY 2009. One notable result of TRAC's analysis is that of these 91,899 immigration prosecutions, only thirteen employers in eight cases were prosecuted for the felony offense of illegal hiring of undocumented workers, as indicated in the detailed discussion below. The long-term trend in prosecutions for immigration matters going back to FY 1989 is shown more clearly in Figure 1. 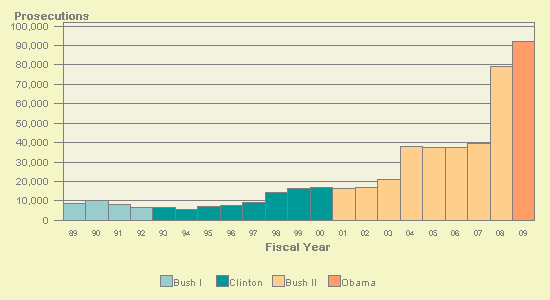 The vertical bars in Figure 1 represent the number of prosecutions of this type recorded each fiscal year. Each presidential administration is distinguished by the color of the bars. The chart shows the increase in immigration prosecutions in FY 2009, which followed an even larger jump that occurred during FY 2008. As is shown in Figure 2, the combined effects of these trends means that immigration prosecutions now make up well over half — 54 percent — of all federal filings. 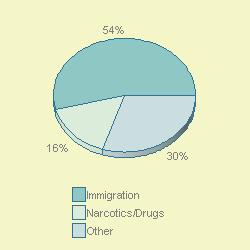 The next largest FY 2009 Justice Department category was drugs, currently representing only 16 percent of the total. This was down from a high point reached during the 1997 war on drugs when such cases made up 37 percent. Looked at over the 24 years since these records began, no other category has ever so dominated the basic work of federal prosecutors. While federal prosecutions of all kinds have increased, the number of prosecutions filed for non-immigration crimes has actually dropped over the past 5 years. In FY 2004 non-immigration prosecutions totaled 81,608; last year they had fallen to only 77,713 (see Figure 3). Because the size of the population grew over the past five years, the level of federal criminal prosecutions in relation to the size of the population for all offenses excluding immigration experienced an even larger drop. Just two lead charges accounted for more than nine out of ten immigration prosecutions (92 percent): illegal entry of an alien and illegal re-entry of an alien under Title 8, Section 1325 and Section 1326, respectively, of the United States Code. Another 3 percent were accounted for fraud in the use of visas, permits, and other forms of IDs. Out of the 91,899 immigration prosecutions last year, only 13 employers in 8 cases were prosecuted for the felony offense of illegal hiring of undocumented workers under Subsection (a)(3)(A) of Title 8 USC 1324. An additional 36 individuals in 24 cases were charged with a petty offense under Section 1324a of Title 8 of the United States Code for recruiting, referring for a fee, or employing an alien knowing the alien is unauthorized for such employment. This dramatic change in the composition of criminal case workload is also reflected in terms of which federal investigative agencies are referring cases for prosecution. As shown in Figure 4, the FBI — which at one time was the premier investigative agency with the largest share of investigations resulting in prosecutions — has now slid to fourth place, accounting for only 8.7 percent of the FY 2009 filings. Leading the pack last year was Customs and Border Protection in the Department of Homeland Security, which includes the Border Patrol, with 46.5 percent of all prosecutions. 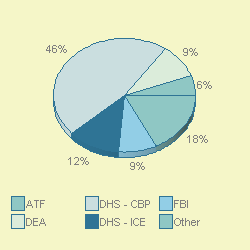 Coming second was Immigration and Customs Enforcement (ICE) with 12 percent, also in Homeland Security. In third place was the Drug Enforcement Administration (DEA) which accounted for 9.5 percent of all prosecutions. The prosecutions of these kinds of white-collar crimes, however, have never appeared to have been a major concern of the Justice Department and the investigative agencies like the FBI and the Securities and Exchange Commission. In FY 2009, for example, Justice Department data showed there were only 178 securities fraud prosecutions. While up 22 percent from 2008, this figure still only represents about a third of what it was in 2002, when there were 513 such prosecutions. For another business category, corporate fraud, the data indicate a grand total of 82 prosecutions, down to about a quarter of what it was — 322 prosecutions — in 2003, the first year this category was used. Although such cases obviously are among the most difficult for the government to prove, they seem infinitesimal when compared to the 91,899 immigration prosecutions.